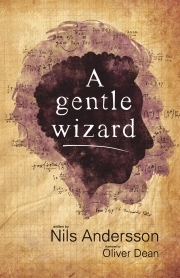 Description of "A gentle wizard"
Nils Andersson is an award winning scientist and celebrated author of children's books. Originally from Sweden, he lives in the UK where he works as professor of Applied Mathematics. He is an expert on Einstein's relativity, black holes, neutron stars and gravitational waves. He regularly gives lectures to the general public on various aspects of physics and astronomy. Nils has written a series of entertaining books about the, somewhat accident prone, inventor Professor Kompressor. The stories draw on real science for their inspiration, but reality is possibly stretched just a little. There are currently four books in the series. The third book, Professor Kompressor Under Cover won the Silver Award in the 2015 Wishing Shelf book awards. In 2017 Nils finished a mixed fact-fiction book about Albert Einstein and his theory of gravity. A Gentle Wizard, which was illustrated by the talented Oliver Dean, takes the reader on an entertaining journey through Einstein's wonky universe, explaining the main ideas along the way. Starting with a walk through Bern in Switzerland in 1905, the book culminates with the discovery of gravitational waves in 2015. The book recently won the non-fiction category of the 2017 Kindle Book awards. Reviews of "A gentle wizard"